pine by pine like damned souls. waiting the order to evacuate. closed most of the year. I was twelve, excited by danger. 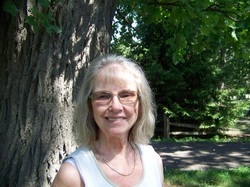 Joan Colby has published widely in journals such as Poetry, Atlanta Review, South Dakota Review, Gargoyle, Pinyon, Little Patuxent Review, Spillway, Midwestern Gothic and others. Her awards include two Illinois Arts Council Literary Awards and an Illinois Arts Council Fellowship in Literature. She has published 18 books including, Selected Poems from FutureCycle Press which received the 2013 FutureCycle Prize and Ribcage from Glass Lyre Press which has been awarded the 2015 Kithara Book Prize. Three of her poems have been featured on Verse Daily and another is among the winners of the 2016 Atlanta Review International Poetry Contest. Her newest books are Carnival which was published by FutureCycle Press in 2016 and The Seven Heavenly Virtues just out from Kelsay Books. Her next book, Her Heartsongs, will be published by Presa Press in 2018. Colby is a senior editor of FutureCycle Press.